Sting operations "take place in this context have the potential not only to unfairly incriminate an innocent suffering person," CAIR attorney Rachel Roberts said in a March article. However, stings have been a law enforcement staple for generations in fighting drug trafficking and other crimes. They've also been used to thwart terrorist plots targeting Muslims. And CAIR's argument has yet to persuade courts to dismiss terrorism charges. But that hasn't stopped CAIR and its allies from trying to discredit the use of informants and undercover agents. In addition to thwarting possible attacks, the mere consideration an informant might be out there helps keep terrorists off balance and prevent attacks, Mubin Shaikh, a Canadian Muslim counterterrorism expert told the Investigative Project on Terrorism (IPT). "The only way that covert criminality can be uncovered is through covert collection," Shaikh said, "and these are basic concepts that CAIR and others are just unable to comprehend." Shaikh has first-hand experience with sting operations. He infiltrated and helped bring down what later was later called the "Toronto 18" al-Qaida cell for Canadian authorities a decade ago. CAIR and its allies are woefully ignorant of how sting operations work, he said. And CAIR didn't voice concerns about entrapment when an FBI sting operation shut down a Kansas militia group that wanted to kill Muslims in 2016. "Why didn't CAIR or other organizations call that entrapment?" Shaikh asked. "There is a clear double standard in how they apply that test." In fact, CAIR Executive Director Nihad Awad thanked the FBI for its effort the Kansas case. The most recent example comes from Cleveland, where FBI officials say Demetrius Pitts planned to bomb the recent July 4th parade in al-Qaida's name. He planned to use remote-controlled cars as improvised-explosive devices (IEDs). Pitts and an undercover FBI agent searched Google for a map of downtown Cleveland to help plot the attack. He also planned a large explosion in front of the city's Coast Guard station. The FBI first paid attention to Pitts in December 2015, after he posted comments on Facebook expressing his desire to see America destroyed. Fifteen months later, that talk turned to learning to shoot guns and use hand grenades. "We should always be prepared to fight in the name of Allah Akbar," he wrote. "All cowards stay home." The FBI didn't send the undercover agent in until last month after Pitts's rhetoric intensified. Recorded conversations show he was intent on waging deadly attacks. "I'm trying to figure out something that would shake them up on the 4th of July," he said. "...What would hit them in the core? ... have a bomb blow up the 4th of July parade." Yet, in CAIR's eyes, Pitts is just the latest "vulnerable" person showing signs of mental illness to be allegedly entrapped by the FBI and pushed to the edge of committing crimes, the Cleveland Plain Dealer reported earlier this month. "This case strains credulity," Julia Shearson, executive director of CAIR's Cleveland chapter, told the Cleveland Plain Dealer. "We don't have all the information yet, but on the face of the complaint, it looks like [Pitts] had very limited means to carry this out." FBI officials saw Pitts as a "dangerous" person who needed to be taken off the streets, and the affidavit introduced in Pitts' case clearly shows his enthusiasm for wanting to kill people. The results could have been tragic had Pitts connected with an actual terrorist recruiter or al-Qaida member before the FBI identified him as a threat. The Boston Marathon bombing is an example of what can happen when someone commits to wage a terrorist attack and goes undetected. The Tsarnaevs weren't sophisticated bomb-makers, but they managed to kill four people – including a 8-year-old boy – and injure more than 250 others. · A 2009 FBI sting operation involving four New York Muslim converts who conspired to shoot down a U.S. military aircraft using what they thought was a Stinger missile at Stewart Air National Guard base in Newburgh. Their FBI contact drove them to a warehouse in Connecticut to inspect the fake anti-aircraft missile. This plot also included a plan to blow up a synagogue and a community center in the Riverside section of the Bronx. CAIR complained that one defendant suffered from a form of schizophrenia, and that the others were impoverished and had prior criminal rap sheets. The entrapment claim was memorialized in a 2014 HBO documentary, "The Newburgh Sting," that also was shown at the Tribeca Film Festival. By then, the Second Circuit Court of Appeals already had rejected the defense's entrapment claim. · Sami Osmakac is a naturalized American citizen born in Kosovo who was convicted in 2014 of plotting to use a car bomb, grenades and a suicide bomb against a popular Irish pub and the Hard Rock Hotel in Tampa. CAIR Florida Executive Director Hassan Shibly painted Osmakac as a "mentally disturbed youth" who was a victim of government entrapment. Following Osmakac's 2012 arrest, Shibly questioned whether Osmakac posed any threat without the FBI's involvement. The 11th Circuit Court of Appeals upheld Osmakac's conviction in 2017, finding "substantial evidence of Osmakac's guilt, including substantial evidence of his propensity to commit a crime of this nature well before he met the [confidential source] in 2011." · Attempted Portland, Ore. bomber Mohamed Mohamud drew the FBI's attention by contributing four articles to a pioneering English-language jihadi publication called Jihad Recollections under a pseudonym. He later told undercover FBI agents posing as al-Qaida recruiters that he wanted to become a martyr and set off a car bomb. Agents helped Mohamud get supplies to build a car bomb and test detonated one prior to his planned November 2010 attack. FBI agents arrested Mohamud when he was about to carry out the operation. Mohamud chose the target – a Christmas tree lighting ceremony that promised to be packed with families – noted U.S District Judge Garr King, who in 2014 sentenced Mohamud to 40 years in prison. Instead of holding Mohamud responsible for his choices, CAIR attacked the FBI, saying it "advanced Mohamud through the process of radicalization, enabled, and pressured him at a point where he could have possibly abandoned such violent ideologies." Still, the liberal Ninth Circuit Court of Appeals rejected the entrapment defense citing evidence including his Jihad Recollections writing, which "provided ample evidence of his predisposition to carry out the charged crime. In those articles, he, among other things, coached people on how to prepare themselves physically to attack and kill their Western enemies, and saluted those in Afghanistan who 'finish[ed] off' wounded American soldiers." · Massachusetts resident Rezwan Ferdaus planned to fly remote-controlled miniature planes packed with explosives into the Pentagon and the U.S. Capitol to kill as many unbelievers as possible in 2011. Ferdaus also thought he was giving weapons to al-Qaida operatives for use against U.S. service members overseas. He discussed his plan with undercover FBI agents who he believed were al-Qaida members and gave them detailed written attack plans. He also sought their help obtaining explosives, grenades and assault rifles. "There is a big, big difference between a plot initiated by the FBI and a plot initiated by a suspect, and it seems this might have been initiated by the FBI," CAIR spokesman Ibrahim Hooper said after Ferdaus was arrested. In fact, the undercover agents "told Ferdaus more than 25 times that he did not have to go through with his plan to attack the Pentagon and Capitol, that there was no shame in backing out, and that he could turn back at any time," a Justice Department news release said. "In response to these inquiries, Ferdaus repeatedly reaffirmed his commitment to his attack plans and his hope to cause mass destruction and psychological harm to the United States." Ferdaus pleaded guilty in 2012 and is serving a 17 year prison sentence. Elton Simpson, who opened fire in an ISIS-inspired attack on a "Draw Muhammad" cartoon contest in Garland, Texas, offers a textbook example of why sting operations are needed, Shaikh said. He was sentenced to three years of probation in 2010 for making false statements to the FBI during an investigation into an Arizona terrorist cell. This brush with the law did not quench Simpson's thirst for jihad. Instead of connecting with an FBI informant again, the next time he developed an interest in jihad he made contact with the real thing. He connected in April 2015 with ISIS recruiter Junaid Hussain, known better by his nom de guerre Abu Hussain al-Britani. Two weeks later, Simpson and Nadir Soofi launched their failed attack on the "Everyone Draw Muhammad Day" event. An off-duty traffic officer shot Simpson and Soofi dead before they could enter the building. "We're not going to wait until the person actually finds a legitimate al-Qaida recruiter, makes a bomb and goes off and tries to detonate the bomb, and then arrest the person," Shaikh said. "No sensible law enforcement agency is going to sit back and let that happen. That is why a sting operation is deployed." Law enforcement sting operations can have invisible benefits, too, by instilling mistrust. Potential terrorists "are always going to be on edge not knowing which member of their group is in fact an undercover," Shaikh said. ISIS supporters have published e-books like Safety and Security guidelines for Lone Wolf Mujahideen to warn potential lone jihadis about how to evade sting operations. CAIR continues to make entrapment claims a standard organizational response to any thwarted terrorist plot involving informants and undercover agents. It's a self-serving move because CAIR expresses no similar concern when Muslims are the intended targets. And it's a stubborn move considering its absolute failure in court. 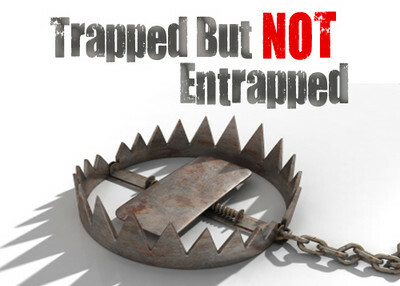 The entrapment narrative is irresponsible and a threat to national security.